Lately, I’ve been thinking a lot about uncanny—mysterious, strong, admirable, courageous, selfless—black women in literature. More specifically, I've been thinking about how sci-fi writer Octavia Butler portrays these kinds of women in her works. 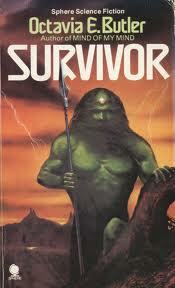 I recently read Butler's novel Survivor (1978), where I discovered yet another fascinating female character. Alanna, an Afro-Asian woman, who “was ugly almost beyond description” whose “eyes were wrong” and “nose too large,” is a remarkably extraordinary protagonist. The only human, more importantly, the only black woman in the story to survive in the wild jungle before she was old enough to fend for herself exerts an unusual amount of mental and emotional strength. Adopted and “civilized” by missionaries who happened to stumble across her in the jungle, then taken captive by alien beings for two years forced to submit to their culture, Alanna exhibits a keen determination to survive. If that were not enough, Alanna successfully withdraws from a highly addictive and deadly substance known as a meklah fruit only to be forced to consume it again, and then she has to undergo more days of painful withdrawal. Alanna endures a series of heartbreaking circumstances and thus deserves a place among the other women in Butler’s Patternist series. In one scene in particular, Alanna reveals that she refuses to be made a mockery of and asserts herself against a well-known hunter in the Tehkohn community—an act that could end her life because no one in her right mind would challenge a fighter if they wanted to live. The hunter tripped her while she was carrying a heavy basket, and in anger Alanna, “her hand closed on what was thought was a small ohkah…hurled it hard into his face. The hunter shouted, fell, and did not get up.” Alanna’s actions shocked others in the village because hunters were “trained to kill with their hands and possessed great strength.” No other character, human or alien, had lived to see such a triumph. Alanna’s exceptional wit, unusual survival instincts, and nonconforming ways allow her to fit rather comfortably alongside Butler's other prominent protagonists--Anywanwu, Mary, Keira, and Amber.